Our Technology offers numerous benefits benefits by automating common operations using TRAC18 GPS software, in concert with our RK3000, including interfaces with a variety of switches and sensors, and the ability to operate valves and relays remotely. All of the screens (and many more) can be viewed on a PC, laptop, tablet, smartphone or smart TV; through most browsers (Internet Explorer 9+, Chrome, and Firefox); from anywhere in the world you have an internet connection. All our software is cloud based, and is accessible 24/7 at no extra cost to you. And unique to Road King Technologies; your clients can log in and see a filtered view of trucks en route to their job-sites. Please take a moment to overview our software with this quick presentation. have to reserve space in your office for a powerful and expensive server. need to install complex programs like SQL Server, perform backups or have an emergency power supply. need staff to maintain and upgrade the software. need to pay year after year for support or to renew your licence. need to waste valuable staff time learning complex multi-user software. You just need Internet access and you’re up and running... INSTANTLY! No Need to install complex programs like SQL Server, backup process and emergency power supply. No Need for staff to maintain and upgrade the software. need to pay year after year for your support or to renew your licence. The Vehicle Status screen gives you more! Geofence, Zones and Area are powerful supervisor tools. • Any device with a browser, i.e. PC, Mobile, Tablet and even smart TV. It’s easy to access and easy to learn, and best of all, it’s available 24/7 from anywhere. • TRAC18 GPS is your business website! It’s made from your business logo and layout. Our web designer will make it look and fit well with your current website if you already have one. • By having your private custom website access, you will be able to manage user access, and see who is on your site and when. The assigned supervisor sets all options from the control panel. • The friendly user interface makes it simple to manage multiple dispatchers, supervisors, contractors, truck rentals and more. • Your customers will love to securely login and follow their delivery trucks on a global map. Data history can be kept for over 10 years. View reports, trace route deliveries or re-print with a delivery ticket. Road King TRAC18 GPS is web-based software; this means you can access it from anywhere internet access is available. • Private messaging and chat are also available on your website for your community of users. • The global view gives you the most advanced interactive map available. • You are connected in real time with all your devices in a single place. All data refreshes instantly after each event. • Coordinate multiple vehicles from many plants for many jobsites, all at the same time. TRAC18 GPS takes advantage of Google resources to help your team make the right decisions. • Click on any pin on the map (plants, job sites, etc.) to see additional LIVE data information. • This option is available and filtered for you community of users like : staff, customers, supervisor, truck rental partners etc. • In the global view interface, all pins and objects are clickable. This allows you to quickly access important information and interact with the map. • Click on vehicles to see speed, driver’s name, ticket number, job number, discharge status, vehicle condition and more. • Click on a job site to see all trucks currently on site. See details and the status of the job site, how much is left to batch, how much is on the road for delivery, etc. • Click on any plant to get production details. • Click a geofence to change the shape or to trigger special status/alerts. • The Global View offers additional information. The right panel is hidden and resizable. It gives you the ability to see sensitive information on demand, without quitting your current view or zoom level. •The Global View also informs you who is making an illegal stop, when and why. You also have the estimated time of arrival of all vehicles at the plant, so you can quickly prepare the next batch for the right vehicle. • Supervise or receive alerts on vehicles out of the yard without tickets. • Find the best way to get to a job site or go back to the plant with one click. • Global view has many impressive and powerful features. Try it! • If you need an interactive overview of all current job site status and deliveries then you will appreciate our Delivery Screen. • The information provided is very powerful and detailed. With one click, you get more info on a specific job, vehicle or discharge status. • View barrel content in real time. See how much left in the barrel and how much water was added. See timed status with one quick look. • See the route used by vehicles to get to their destinations. Verify each point in detail for present and past deliveries. • See our “hidden benefits”, a series of past experiences, that highlight some of the advantages of Trac18..
• Automatically send the next ticket from your dispatch software to a tablet. • The ticket is dynamic and fully editable by the driver, including all times, approval from the batching plant supervisor, added water, etc. • You have the ability to add products to the ticket on the fly. You can record voice notes or take pictures to explain and support unusual circumstances. • The driver can receive the next delivery ticket without leaving the vehicle. • Once signed, the POD (proof of delivery) is emailed as a PDF document to your Accounting Department. • Auto send signed ticket and or invoice by e-mail to the customer or client office. • Your staff will enjoy using the Vehicle Status screen. They will be able to quickly make a note on a vehicle or driver to inform other users, dispatchers or supervisors about special conditions. • Vehicle capacity, restrictions, condition, current status etc. are recorded, allowing you to follow the evolution of your request. • Notes are automatically relayed to the garage staff if needed. This option is linked to the preventive maintenance schedule, allowing you to keep track of vehicle conditions without having to quit your current screen. • Street view helps validate truck location. Visualization of any unscheduled stop, whether on the road or at a coffee shop, is easily confirmed. Retrace or reconstruct any specific past event with amazing precision and detail. • Make special zones and areas for reports, alerts and surveillance. Establish areas in the yard for all plants, e.g. washing zone, slump adjustment, recycling, making blocks, etc., or anywhere on the map, such as restaurants, coffee shops, gas stations, etc. Zones can be as large as a province or state; for measuring time or gas consumption for tax purposes. • Engine ON, illegal discharge, water added, unscheduled stop, time wasted etc. ; all can be combined with zones and areas for specific alerts. • Receive alerts in real time in the form of SMS or email, about anything and at any time! • RFID card readers give you the ability to precisely calculate direct labor costs, allowing you to fully understand, organise and coordinate different labor-related events. — Automatically calculate overtime for drivers, subcontractors, mechanics or office staff. — Quickly see who is in and out. — Match vehicles and drivers. — Improve your job costing. — For drivers, office and job site workers. • In addition to those already available, Road King constantly develops new reports and graphics for the community. • We take your comments and suggestions very seriously and are always available for custom reports and/or data export to your accounting system. • Automatically schedule maintenance checkups. Generate multiple work orders for truck make, model, year, engine time, odometer etc. • Assign work orders based on employee mechanical skill level. Includes required inspections for all benchmarks. • Receive alerts and warnings before problems occur. • All maintenance is logged, including jobs and parts details. • Parts and inventory maintenance and auto purchase order generator. • Generate Profit/Cost reports for truck repair and shop productivity. Excessive Expenses reports provide information for the selection of truck replacements. • Easily set up and deploy tasks to all vehicles. • Choose reports and filter settings to print only what is required. • Automatically send and export reports. • Road King Technologies has developed a plethora of methods to communicate between different batching/dispatching systems. This allows your vehicles on the road to fully interact LIVE with your dispatching and most of your preferred office software. • The RKT connector software can be downloaded and installed locally on any Microsoft Windows computer. 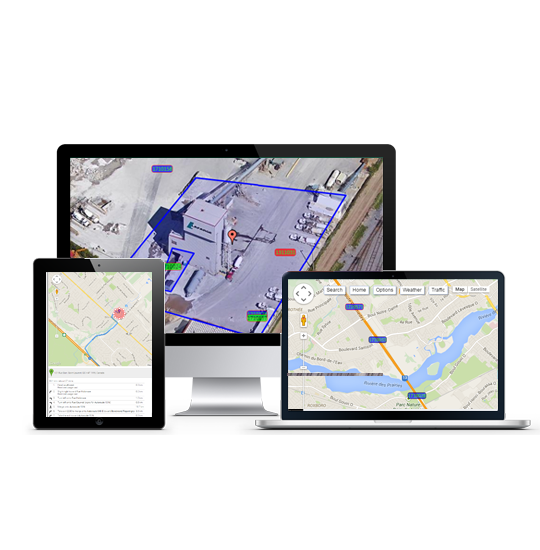 • TRAC18 GPS software is compatible with any batching and dispatching software on the market and can link to any 3rd party software for synchronization and/or export. • E-TICKET is also fully compatible with your current installation. No need for major changes, and for the drivers, the learning curve is rapid. • All our programs and setups are fully compatible and upgradable. • Road King Technologies is proud to take care of your connectivity requirements.